Dragonflies are among the fastest flying insects in the world. They can fly backwards, change direction in mid-air and hover for up to a minute while maintaining a fixed position above the ground. There are almost 6000 species worldwide. Here in the UK there are 56 species, a figure that includes closely related damselflies. Dragonflies are easily identified as they hold their wings perpendicular to their bodies whereas damselflies hold theirs closed above the torso when at rest. We have a variety of slow flowing water habitats here at The Vyne most of which are fringed with reeds and grasses. These make a perfect spot to observe these acrobatic wonders of nature as they flit about there business of hunting other insects for food or finding a mate. 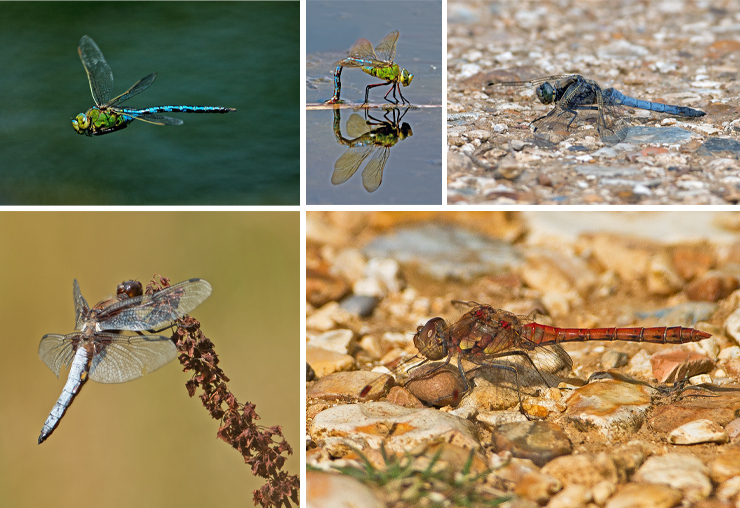 You can observe dragonflies as early as mid April through to September. Warm days are best and if you want to capture images of these wonderful insects you’ll need a camera with either a macro lens for detailed closeups or a 200mm zoom lens. The later will enable you to get in close without disturbing the subject. As you can see below there are many interesting species that can regularly be seen around our lake and wetland areas. So why not pop by and see if you can spot a species we haven’t yet spied? If you manage to capture that prized macro shot. Well, why not share it with us to be featured in a future article here on the blog?